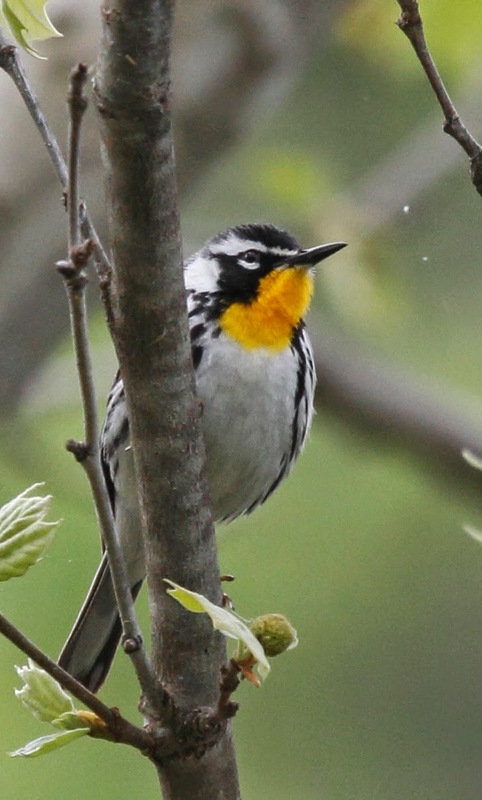 We saw a few other "good" birds at Lost Maples including this Yellow-throated Warbler. We even saw the nest but I didn't get a photo of that. After being blasted by the wind on the trail at Lost Maples, we headed back down to the bird blind. We arrived just in time to meet the "Bird Hosts" who were filling the feeders. Campgrounds often have "Hosts" - people who camp there alot and volunteer to be available for questions, organize campground activities, etc. The "Hosts" at Lost Maples do that plus they lead bird walks and volunteer to fill the feeders etc. Our Hosts were Les and Jane. They were really friendly and obviously knew what birds we were looking for. 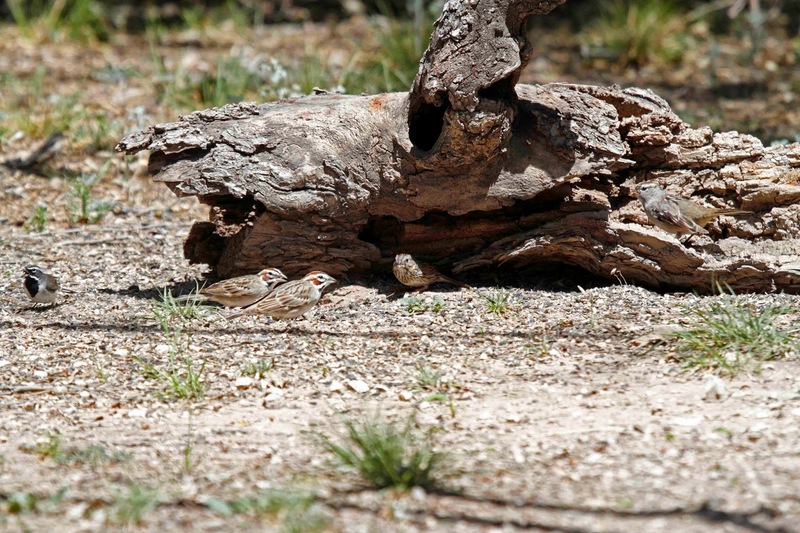 We told them about our success with Golden-cheeked Warbler and asked about Black-capped Vireo. We were bummed when Les told us that we would have to hike really far in the park and would probably strike out due to the wind. Crap. Our mood lightened when Les asked us if we had time to go to another park which would give us a better shot at the Vireo and had multiple bird blinds. He gave us directions and told us to stop by their campsite on our way out to see the Lazuli Bunting which was at their feeder. 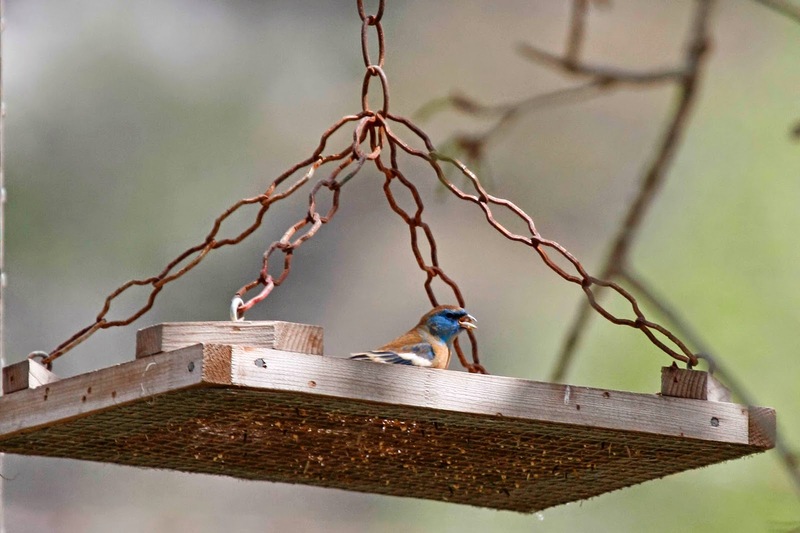 Lazuli Bunting at a feeder - wow. I want you to notice the angle of the platform feeder in the photo. It was rocking like a swing set. This is the best photo that I could get. The rest of the photos show the bottom of the feeder. It was really windy. So, off we went to Llano River State Park in Junction Texas. It took us over an hour to get there but it was worth it right away. 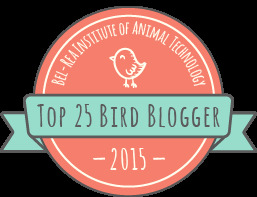 We found the first bird blind and saw a show - mostly sparrows but also other "good" birds. Here are a few. 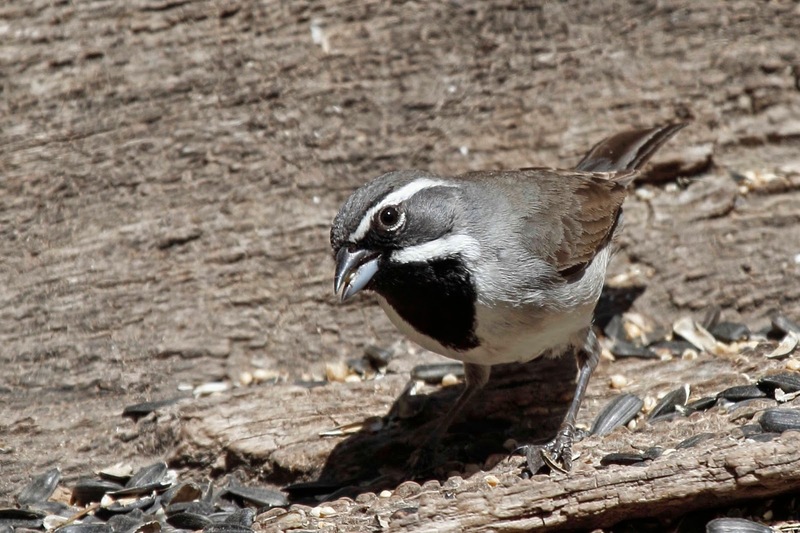 The first is Black-throated Sparrow -a very handsome bird. 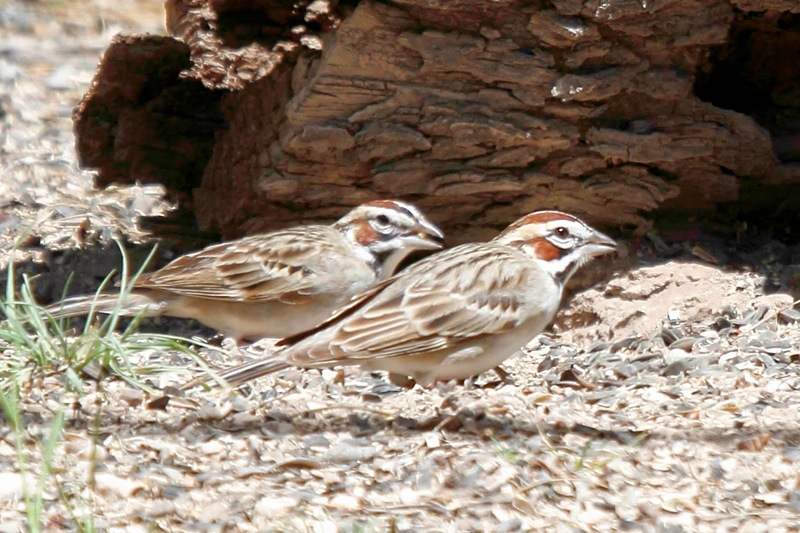 Here are Lark Sparrows. They look like they are wearing a helmet. We get a few of these in our area in the fall but they don't have the helmet. In fact, the feeders and water at the bird blind worked so well that I got a photo with 4 different sparrow species in it. You will have to zoom in to see the birds - Black-throated, Lark, Lincoln's and White-crowned. 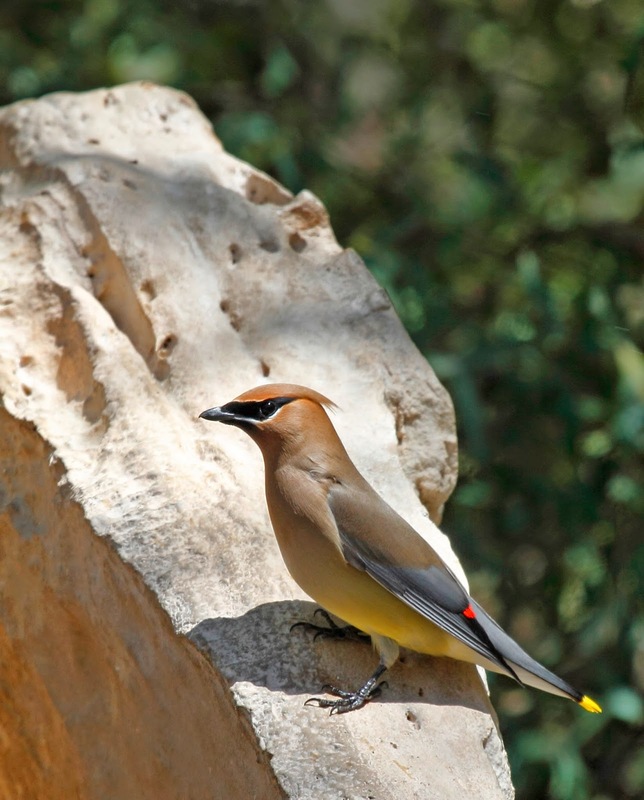 Next is Cedar Waxwing at the bird bath. We have these birds in our area but we rarely see them so close. They must really need the water since Texas is so dry. 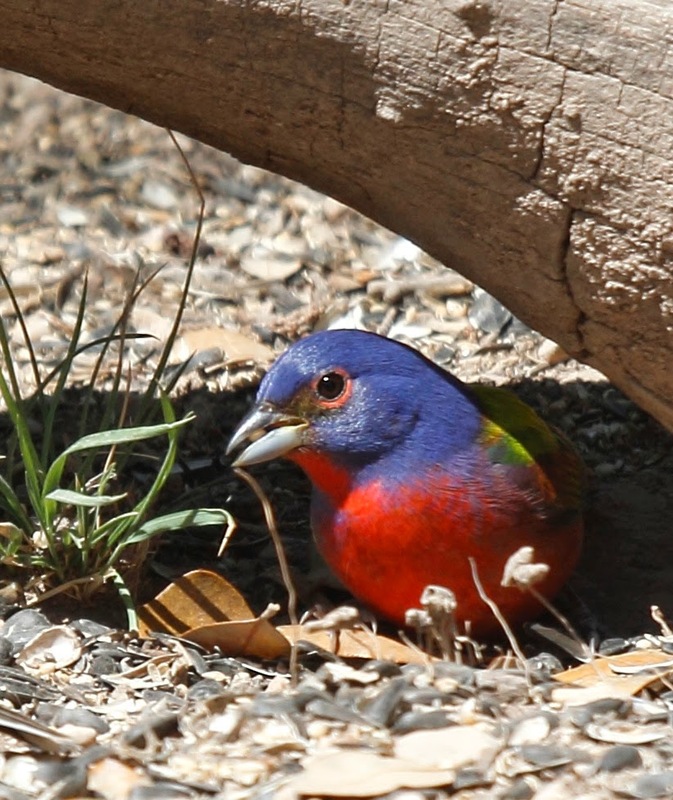 This is a male Painted Bunting. This is one of those birds that you see in the Field Guide and go "no way does a bird look like that" but then you see one and it does. We left the bird blind and headed to the Visitor's Center. 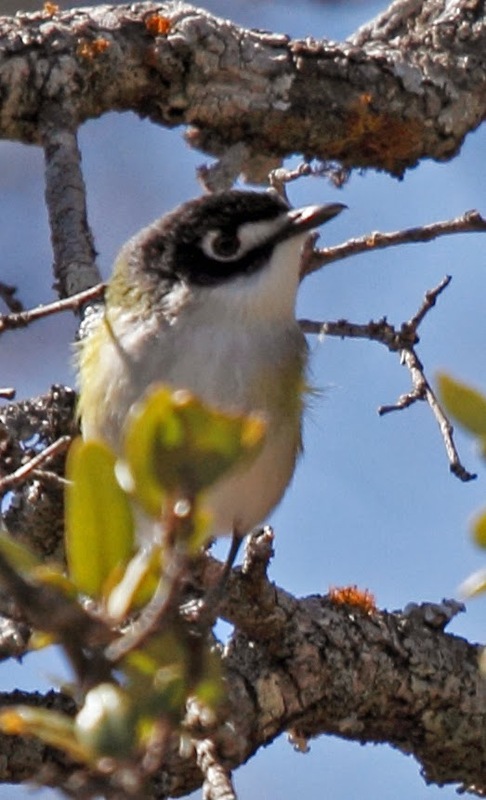 The staff directed us to the best area for our target - Black-capped Vireo. You have to understand that I have wanted to see one of these ever since I saw one in my first field guide. It's the white spectacles that really set it apart from other birds. Lori and I studied the call but thankfully, we ran into another group of birders along the trail who had already found one of the birds. Randy is a local guy from Junction. He pointed out the bird and also showed us a Black-capped Vireo nest! Unbelievable. 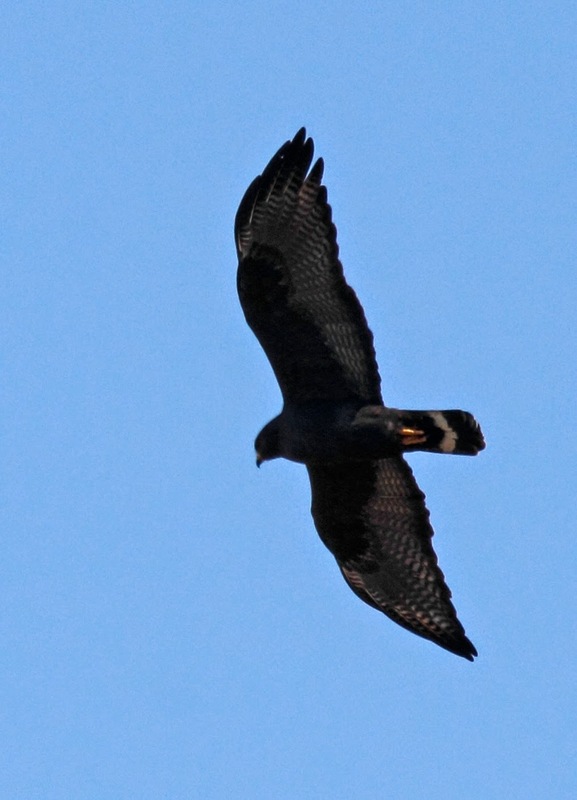 Oh, and he also pointed out a Zone-tailed Hawk soaring overhead. Bonus! We ended up having a great day. We got 3 target species and even had lunch at an authentic Texas BBQ joint called Cooper's. We are really getting a kick out of the Texans - they fly that state flag everywhere. If you see a US flag, you also see the Lone Star. Really great stuff and I'm too tired to be snarky. Just come home safe and sound.